Season two of the original Netflix series Orange is the New Black (OITNB) was released on Friday, but fans of the series took over social media days before by posting tweets and messages about the long awaited released date. The first season of OITNB was not an instant hit when it was released last July, but as fans talked about the news of this comedy-drama over many social media platforms, the show became a hit just a few months later. Orange is the New Black is based on the book by Piper Kerman, who reveals her life as an inmate in a women’s prison. The Netflix series changes Piper’s last name to Chapman, and adds on some more drama and entertainment for the viewers, including Piper’s love affair with Alex Vause, played by former actress of That 70’s Show, Laura Prepon. It took a whole year before the acclaimed Netflix show was back for season two. 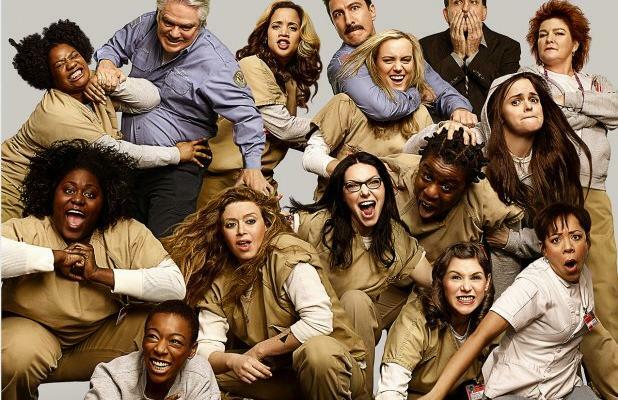 While fans waited impatiently for the series to begin, a few weeks shy of its released date, Netflix released character posters of the ladies of Litchfield prison, giving fans a little tease of what the show had in store for them. Social media played a big role on the show’s comeback, including bringing back Prepon’s sultry character, Alex Vause; which became a huge internet sensation after the first season. Fans posted memes and photos of the famed Orange Is the New Black series character, which took over social media. Although Prepon did not have a contract to come back for season two, the fans high demand made Jenji Kohan, the creator of the show, bring back her character for at least four more episodes. If Orange Is the New Black continues with a third season, fans will not be disappointed; sources claim that Prepon will sign a full time contract to continue in the program. The series’ popularity also made many fans without a Netflix account find ways to download and watch the second season while interacting through social media. According to Variety, within just a few days of its released date, the program had already been pirated more than 55,000 times over the internet. This number shows the increasing rate of fans compared to the program’s first season, which was downloaded illegally approximately 3,800 times in the first two days of its running. In addition, the Orange Is the New Black series’ increasing fan based took over social media channels. Followers of the show created Facebook groups such as “Addicted 2 OITNB” and “OITNB Quotes,” as a way to interact with one another, and not to mention its more than 1 million likes on the show’s official Facebook account. On Instagram, the series gained over 200,000 followers, as they were given behind the scenes photos and short videos with sneak peeks of season two. The cast posted candid photos and selfies, and the account even posted an inside look to some of show’s red carpet events. Netflix also launched a new application Orange is the new APP that lets fans share memes, emojis and even add their own photo to a funny card featuring the fans’ favorite cast members. Fans who have been binge-watching the program’s second season are already talking about how they cannot wait for the show to continue with its third season next year.